Because of windy conditions, we missed anchoring in beautiful Sorrento, but calm seas in and the protected harbor in nearby Naples allowed us to dock. © 2014 Avid Travel Media Inc. This morning, Silver Wind disembarked guests not in Sorrento as scheduled, but in Naples, about an hour’s drive away. Westerly winds, the captain explained, were to blame. Those winds were creating swells that would have made tender operations unsafe, so instead of dropping anchor in Sorrento, we pulled up alongside in Naples. Most tours ran as scheduled with only slight changes to some of the departure times. The captain made a good call, I might add. Last year, I was in Sorrento on another vessel when afternoon swells stopped tender operations between ship and shore. It was a bit of a mess. Half of the ship’s guests were out on morning shore excursions and had to wait out the winds to get back to the ship (they stayed ashore several hours — admittedly, there are worse places to wait than Sorrento). Those with afternoon excursions (me included) had to wait to see if we could tender ashore later. 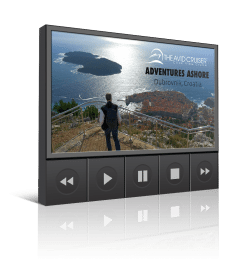 We could not, and so we tossed in the towel and missed a highly anticipated shore excursion along the Amalfi Coast. 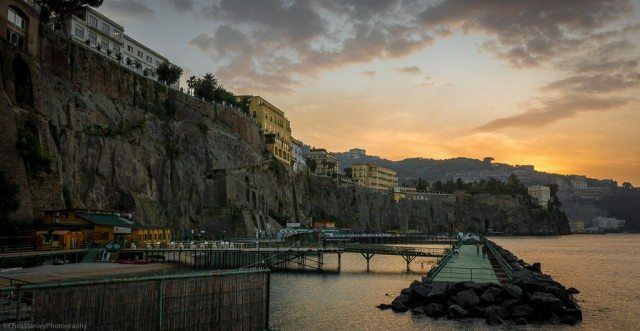 While the port in Naples is nowhere near as picturesque as the bay at Sorrento, the former is protected from the elements and assures disembarkation. It’s good that captains have options when Mother Nature expresses her will. The views were spectacular as we traveled along the Amalfi Coast. We marveled at the roads, carved into the sides of rocks, and the cliffs that plunged into the sparkling turquoise waters of the sea below. 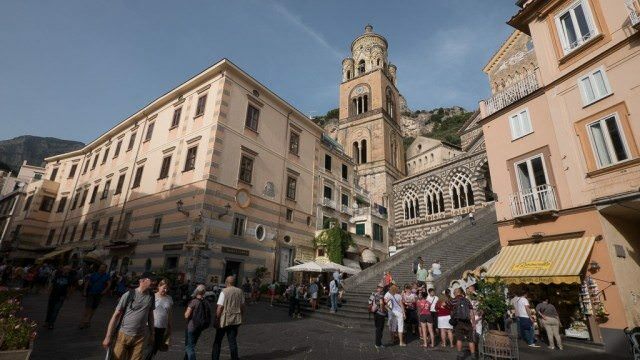 A drive along the Amalfi Coast is a drive like no other, especially in Italy, where busses, cars, mopeds, pedestrians and perhaps the occasional donkey compete for space on roads that can be narrower than some driveways in the United States. On our trip, two busses met with no room to pass one another. Remarkably, one found a way to make space for the other, and with some touch-and-go technique, the busses managed to squeeze pass one another. Before joining Silver Wind, I drove a rental car in the Sorrento region. Traffic was chaotic, but there was order in the chaos. I sensed that there was a system that was innate to Italians and a source of daring for visitors. Navigating roundabouts, for example, felt like an exercise in Russian roulette. Spin the wheels and pull out in traffic, hoping that the others would allow us in — or else. And roundabouts were a way of life. 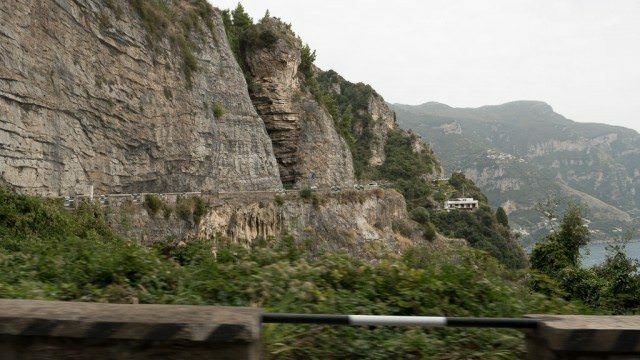 I saw not one traffic light between Sorrento and Amalfi — coupled with more congestion than I have ever seen on such tiny roads. Somehow, though, it all worked. Bold moves that would have resulted in collisions back home succeeded here. Drivers played a game of give and take. Stick your nose into the traffic and take the plunge. The other guy likely will slow down, likely. Be sure to watch the ubiquitous mopeds. And oh yes, there are pedestrians and bicyclists and dogs and cats to content with. I returned my car to Hertz 10 days later with no scratches. I wear that fact like a badge of honor. The highway along the Amalfi Coast is an engineering marvel. © 2014 Avid Travel Media Inc.
Clearly, the Amalfi Coast makes for an exhilarating journey, whether you’re at the wheel or not. You’ll gasp at nearly every turn, from the beauty if not the traffic. We stopped to photograph picturesque Positano, tucked into the seaside hills and accessible down a winding road. 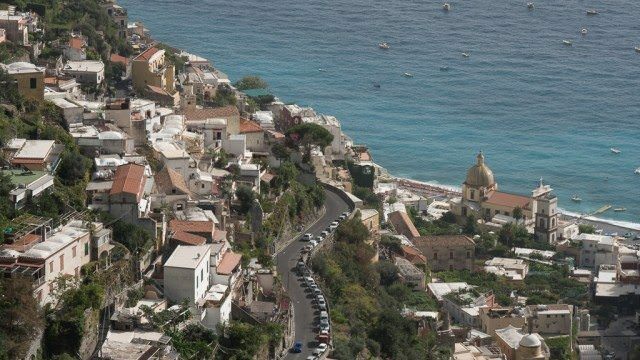 Home to our hotel director, who I mentioned in yesterday’s post, Positano is a popular resort with a celebrated guest list: Hollywood stars, artists and writers, and well-known politicians. 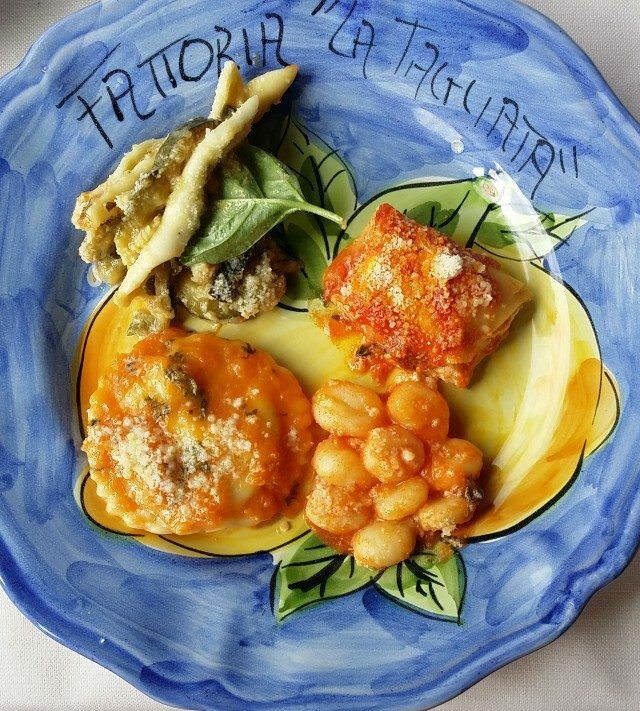 Bill Clinton and family dined at the restaurant where we dined in Positano. A photograph of the presidential family was proudly pinned to one of the walls. Picturesque Positano. © 2014 Avid Travel Media Inc. In the historic town of Amalfi, find your way to the Capuchin Monastery, built in the 12th century, an excellent viewpoint for taking photos, then work your way back into town and the Piazza del Duomo, where you can sit for a cappuccino or a gelato while admiring the Amalfi Cathedral. Order lemon gelato if you wish to enjoy the popular citrus of this region. Dating from the 9th century, the Amalfi Cathedral. © 2014 Avid Travel Media Inc. 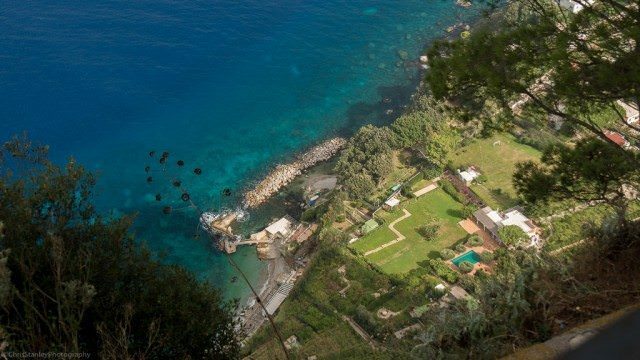 If you appreciate scenic coastal drives along winding roads, picture-postcard-perfect villages and the quaint ruggedness of Amalfi, you’re bound to enjoy a drive along the Amalfi Coast. 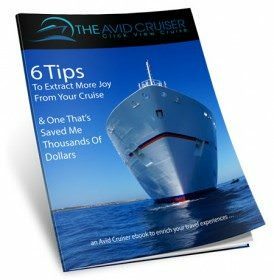 It’s typically a full day excursion, so you won’t have time for anything else unless your ship is overnighting. Still, this excursion is a good one for those who want to absorb the beauty of this endearing stretch of road. Lemon country, the Amalfi region. © 2014 Avid Travel Media Inc. The ruins of Pompeii, destroyed by the still-active volcano at Mount Vesuvius, only five miles away. © 2014 Avid Travel Media Inc. In 79 AD, on a day probably a lot like the one when we were there, Pompeii was bustling with life. People were performing their everyday chores, meeting with friends, preparing meals, doing laundry and such. Then suddenly, the volcano at Mount Vesuvius began to rumble. Vesuvius belched and sent up a plume of pumice and ash that forever changed Pompeii. 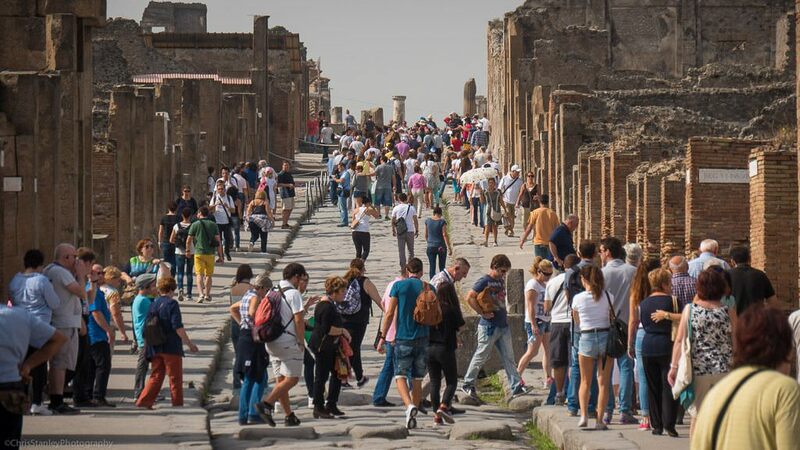 Visiting preserved buildings in Pompeii © 2014 Avid Travel Media Inc.
Bustling only moments before, Pompeii was buried. The eruption killed up to 20,000 people. It was disturbing to see plastered human bodies in the positions they were in during the moments when they were killed. These weren’t reconstructions either. 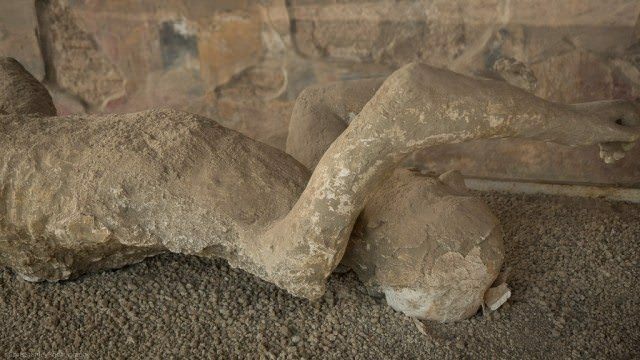 During excavations, plaster was used to fill in the voids between the ash layers that once held human bodies, thus preserving the bodies in their original positions. 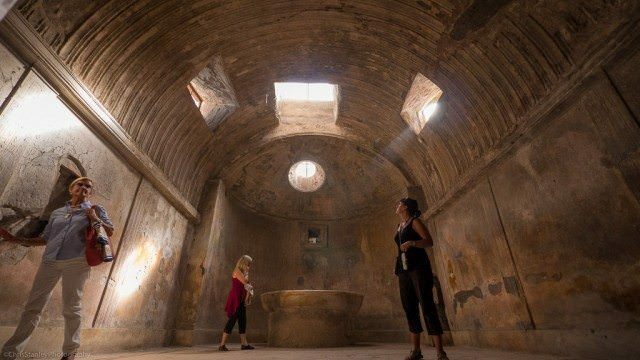 The ash, in fact, eerily preserved Pompeii. 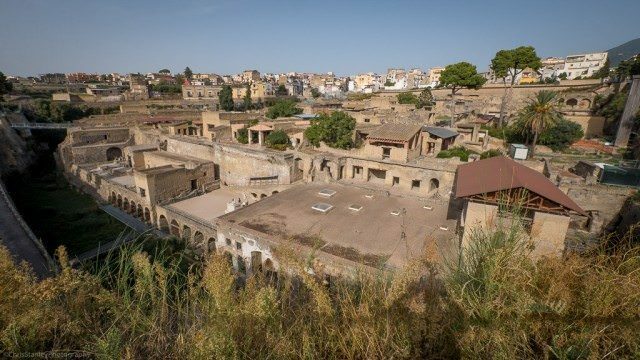 We walked through this UNESCO World Heritage Site to see a town that had been buried in up to 20 feet of volcanic ash for more than 1,500 years. Pompeii had literally been dusted off to reveal a tragedy and an oddity. Frozen in time: During excavations, plaster was used to fill in the voids between the ash layers that once held human bodies, capturing the positions of those who were killed at the time of their deaths. © 2014 Avid Travel Media Inc. It is a bit disconcerting to think that Vesuvius is still active. It is the only volcano on the European mainland that has erupted in the last century. In fact, Vesuvius has erupted more than 50 times during the last 2,000 years. Pompeii has been a tourist destination for more than 250 years. © 2014 Avid Travel Media Inc.
Like Pompeii, Herculaneum was also destroyed by Vesuvius. Unlike Pompeii, however, Herculaneum was only mildly affected by the first phase of the eruption. While roofs in Pompeii collapsed under the weight of falling debris, roofs in Herculaneum accumulated only a few centimeters of ash, causing little damage. Many of the structures were expensive villas overlooking the waterfront. One of the most luxurious was the Villa of the Papyri, which may have been the home of Julius Caesar‘s father in law. During our visit to Herculaneum, we saw preserved paintings, petrified wood, mosaics and much more. Roof tops, building beams, beds, doors, and even food have been preserved and found at Heculaneum, known today to the Italians as Ercolano. When Mount Vesuvius began to erupt, Herculaneum was evacuated, and it was long thought that all of the inhabitants managed to escape. More than 300 bodies have since been discovered, huddled together on the beach and in arched buildings (thought to have been boat houses) like the one in this photograph. © 2014 Avid Travel Media Inc. 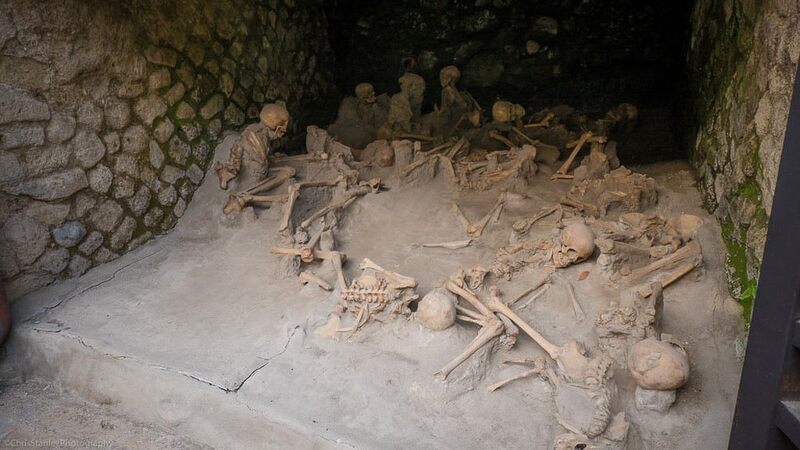 The people of Herculaneum did not think Vesuvius was a serious threat. After all, the volcano had not erupted for about 800 years. Upon eruption, the inhabitants were instantly killed by the intense heat, with temperatures approaching 500 celsius. Herculaneum. © 2014 Avid Travel Media Inc. Eventually, Herculaneum was buried under approximately 20 meters (50–60 feet) of ash that rained down for several hours. The town was later excavated and today appears to be in hole, unlike Pompeii, which is at ground level. Marina Grande in Capri. © 2014 Avid Travel Media Inc.
From Sorrento, it takes less than an hour by boat to get to the Isle of Capri, also referred to as the Island of Dreams. 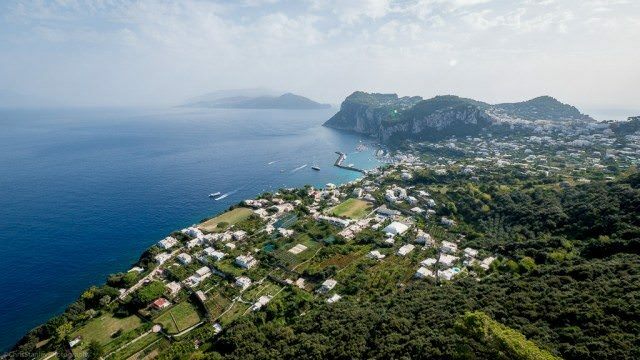 Once on the island, make your way from Marina Grande to Anacapri. 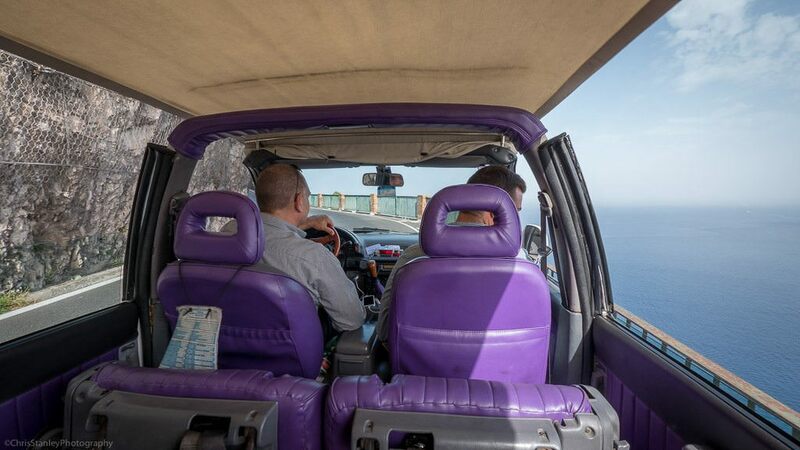 We were seated in an open-air taxi, and the drive was exhilarating. Fear of heights? Close your eyes — if you can. Can you see the road up above? In Capri. © 2014 Avid Travel Media Inc. Though the road was protected by railing, we were right on the edge and gaining elevation rapidly. The views below were beautiful and dizzying. 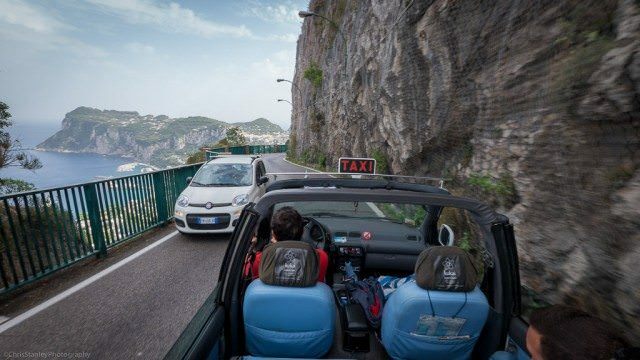 On the edge, a drive on Capri. © 2014 Avid Travel Media Inc.
A long way down on our drive in Capri. © 2014 Avid Travel Media Inc. The view below on our drive in Capri. © 2014 Avid Travel Media Inc.
Once we arrived in Anacapri, we decided to go even higher via a chairlift that reaches the highest point on the island. Chairlift from Anacapri. 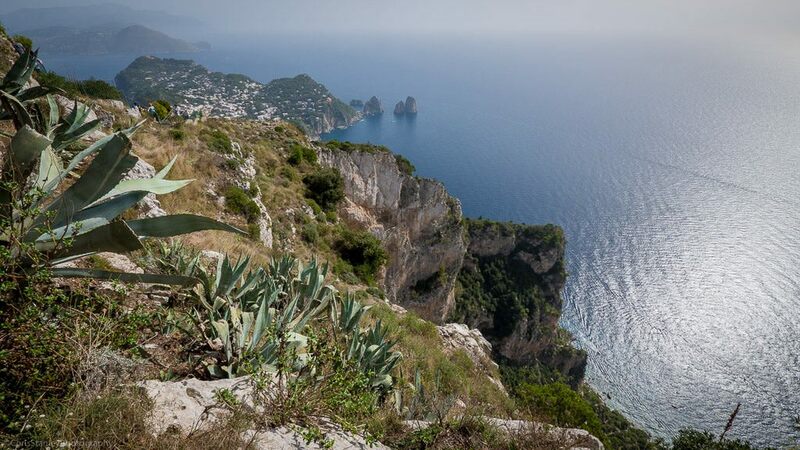 © 2014 Avid Travel Media Inc.
View from the highest point on the Isle of Capri, reached via chairlift. © 2014 Avid Travel Media Inc. Afterward, we visited the Villa San Michele, home of author and physician Axel Munte. The villa was gorgeous, both the home and gardens, and the views. 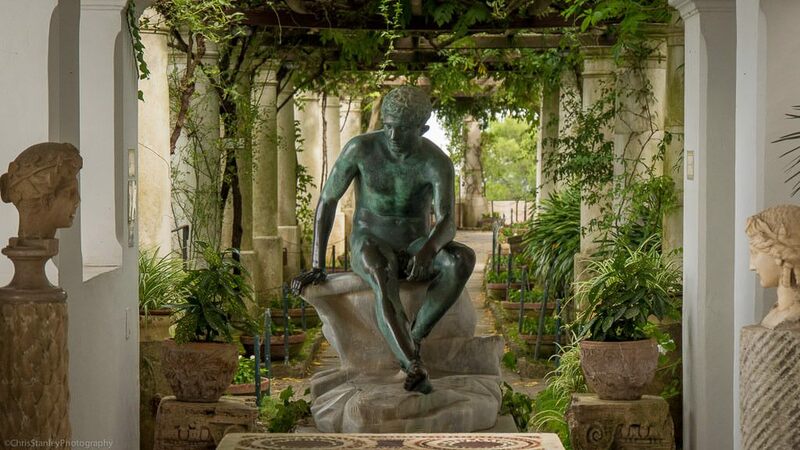 At the Villa San Michele on the Isle of Capri. © 2014 Avid Travel Media Inc.
On our way back to Marina Grande. 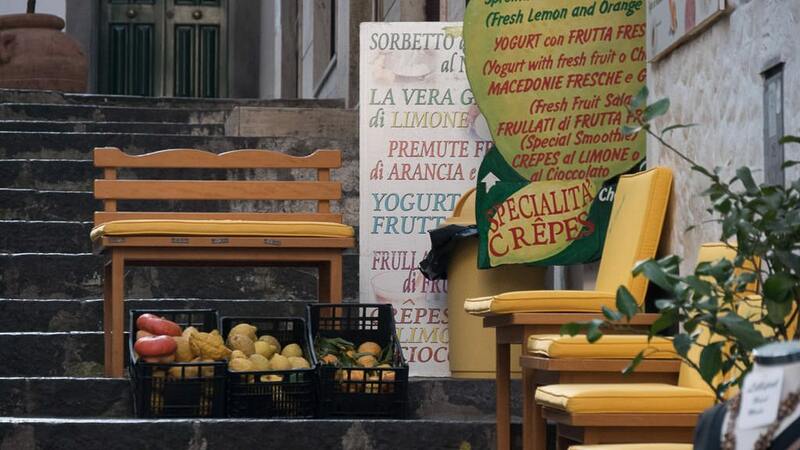 © 2014 Avid Travel Media Inc.
Before heading back to Sorrento, we stopped for a limoncello. The origins of this citrus-infused liqueur are from Capri, and it seemed appropriate to end the day with a toast. 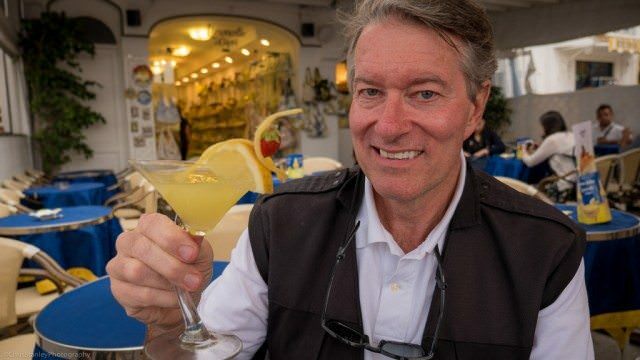 Enjoying a limoncello in Capri. © 2014 Avid Travel Media Inc.